Nightingallery is an interactive musical installation featuring an animatronic bird that talks and sings, engaging members of the public in playful dialogue. The auto-pedagogical performance installation imbues the performance interface -- the animatronic bird -- with agency that is traditionally the reserve of human performers. 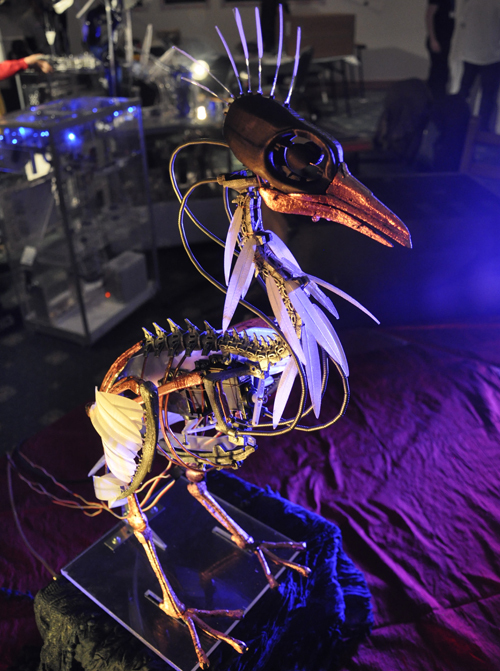 The bird was displayed throughout 2011, including exhibitions at Maker Faire UK, Bestival 2011, and the BBC Free Thinking Festival. View Guy's detailed description of the Nightingallery build. See a video overview of the project.